King Avenue Church, a Reconciling Congregation - Join us to Make Chrismons! Join us to Make Chrismons! We’re kicking off Advent by making Chrismons, ornaments made from Christian symbols. Chrismons were first developed by Frances Spencer and the women of the Ascension Lutheran Church in Danville, VA. 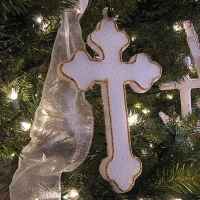 Many churches display a Chrismon tree during the Advent and Christmas season decorated with handmade ornaments. These holiday decorations are beautiful symbols of Christ. The class will be led by educator and artist extraordinaire, Kurt Reichert. The class is free and you get to take home your very own ornament. Ages 11 and up.